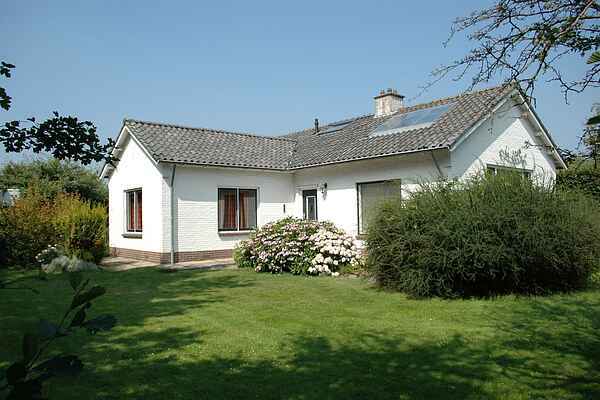 ‘Huis de Bron’ is a fully detached house that can accommodate 8 to 12 people. There is a long dining table in the kitchen where you can enjoy eating and relaxing with your whole group. The living room is a nice place to watch TV or play games in front of the wood stove. The 1-person bedrooms on the first floor are better suited to children because of the slope. The residence also has a caravan situated directly adjacent, where you will find extra bedrooms and a bathroom. There is a terrace with garden furniture where you can sit outside comfortably whenever there’s even a little sun, as it is completely sheltered from the wind. The terrace is covered with grape vines. You have your own parking place with a carport. The large private playing field next to the accommodation offers plenty of room for a wide range of sports. The house also has table tennis, a swing, Dutch shuffleboard, table football and hockey sticks with nets. And free WiFi of course. There is parking on site.